You can create a novel, short story, or screenplay plot from beginning to end, even if you don't know what you want to write about yet. QUICK COURSE DESCRIPTION: How to create a plot from scratch or fix a broken plot from first idea to final revision — whether you’re a planner or a pantser. Want to write fiction but don't know where to start? Do you have a stack of 30-page novels that have stalled? Are you stuck in the vast morass of your novel's middle? Don't know how to figure out your ending? Or do you have the whole first draft done, with the sinking feeling that something's wrong with the story, but you don't know what, or where? You have everything you need within you to start creating brilliant characters today. Every tool includes a description, a demonstration, and an exercise. 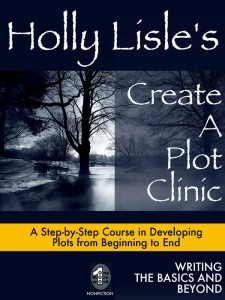 You may need three or four days to get a brand-new working plot in order if you're just getting started. However, if you've been writing for a while--or if you're determined--you can have enough plot to start writing your book in about a day.